Hey, whatever happened to Grand Theft Auto 5's single-player DLC? Speculation regarding GTA 5 single-player DLC has been a hot topic as of late, though truth be told it's been on players' minds since before the game was even announced. Sure there's plenty of things to see and do in the multiplayer mode GTA Online - heists, plane races, demolition derbies, explosive mayhem, even golfing. But that's the problem with games like GTA 5 - when a game gives lets you do anything, you can't help but want everything, plus a little more. And for awhile, it seemed like that was what we were going to get. A Rockstar blog post from December 2013 tells players to look forward to "substantial additions" to the game's story mode. These additions were planned for 2014. In case you needed to check your watch and/or calendar, it's now 2016 and all's quiet on the single-player San Andreas front. So the question is, where is it? It's been three years since GTA 5 first released on Xbox 360 and PS3, two years since it came to Xbox One and PS4, and one year since its arrival on PC. In that time, what have we learned about GTA 5 single-player DLC? Interestingly, most rumors have been spurred not thanks to anyone from Rockstar, but those who work with the studio. Shawn Fonteno, who plays Franklin in GTA 5, told Jack Thriller in 2014 that, "We’re working on the DLC, downloadable content, for Grand Theft Auto 5, and that's real big. That's like, first on my list right now, to finish that up." Fonteno also posted a picture of himself with headphones and what appeared to be a mo-cap suit on Instagram back in June 2015, and another picture in a mo-cap suit, lounging in what look like Rockstar's offices, in January of this year. Fonteno isn't credited with playing anyone else, so this has led fans to believe that when he says "DLC," Fonteno means of the single-player variety. Characters from the single-player portion have shown up in GTA Online, but this hasn't quashed the rumors among fans. If Fonteno is indeed working on story DLC though, either his co-stars don't know about it and aren't involved, or they're better at keeping secrets. 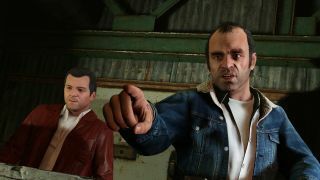 Ned Luke, who plays Michael De Santa, wrote on Facebook in January: "EVERYBODY wants single player DLC... I know NOTHING about that. Don't know when it's gonna happen or even IF it's gonna happen." So what does Rockstar have to say? Surprisingly little. Straus Zelnick, CEO of Rockstar parent company Take-Two Interactive, said during an investor call prior to the game's 2013 release that fans could "safely assume" that there would be "a lot of interesting stuff." The assumption at the time was that this meant single-player DLC, a la The Lost and Damned and The Ballad of Gay Tony for GTA 4, would be coming to GTA 5. However, Rockstar pretty much confirmed that it had dropped development of story DLC when Director of Design at Rockstar North Imran Sarwar spoke to IGN in September 2015. "Right now our focus is on GTA Online which has exceeded our expectations," Sarwar said. "We currently have all key members of the team that launched Grand Theft Auto 5 focused on supporting GTA Online in every capacity." When Sarwar says that GTA Online exceeded expectations, he's not kidding. According to a lawsuit filed by former president of Rockstar North Leslie Benzies, GTA Online has raked in $500 million in revenue thanks to microtransactions. That's half a billion dollars from an online multiplayer mode of a $60 game that hasn't even been out for three full years. For comparison, free-to-play League of Legends, the most popular game in the world (and that's not hyperbole, it literally has more active players across the globe than any other single title), brought in $624 million in 2013. By that point, the game had been out for four years. So yeah. GTA Online earning nearly as much over its relatively short lifetime as LoL did in one year is pretty staggering. I can't say I blame Rockstar for wanting to focus on where the money is rather than sink a ton of resources and time into single-player content. After all, it takes weeks upon months upon years for Rockstar to create its fantastic open worlds, but players will only buy such a piece of DLC once. And according to Take-Two's then-CEO Ben Feder, the market for 2009's The Lost and Damned and The Ballad of Gay Tony was "smaller than initially expected." Meanwhile, a new outfit or car for your GTA Online avatar takes considerably less work to produce, and you can buy as much GTA$ as your real-world wallet can handle. From a "you and me as players who want more story" perspective, it's not very encouraging. But from a business perspective, it makes sense. Now, this isn't to say that GTA 5 single-player DLC will never happen. A screenshot showing Liberty City's Middle Park remade in GTA 5's engine popped up in an online portfolio belonging to a Rockstar artist just last week, and the company is said to have a presence at E3 2016 - something it typically doesn't have. It could be Rockstar is gearing up to announce the long-awaited extra content. Or it could be something else entirely. Or it could all be a coincidence. The only thing we really know for certain in this scenario is that we don't know much. The progress of GTA 5's story DLC has been shrouded in mystery from day one. Before it, even. And though we can look back and see its path traced over the years, odds are that mystery is going to continue for the foreseeable future.